Microsoft has announced an end-to-end IoT security system that's built on microcontroller (MCUs), the sort of devices that use tiny and relatively low-powered embedded objects for connectivity and basic control features. According to the company, the next decade will witness nearly every consumer gadget, every household appliance, and every industrial device connected to the Internet. And all these everyday devices have one thing in common, a tiny chip, called a microcontroller (MCU), hosting the compute, storage, memory, and an operating system right on the device. With these devices as gateway to our homes, workplaces, and sensitive data, they also become targets for attacks. For instance, imagine a typical household and consider what could happen when even the most mundane devices are compromised: a weaponized stove, baby monitors that spy, the contents of your refrigerator being held for ransom. While there hasn't been much of a solution to the internet of things (IoT) security wise, Microsoft hopes to turn the table in its favor with a group of new security products for IoT devices. Microsoft Research came up with the ways to secure this vast number of MCU-powered devices, and by leveraging years of security experience, and learning from across the tech industry, have identified what it calls "the Seven Properties of Highly-Secure Devices". It comprises the need for multiple layers of defense-in-depth, both in hardware and in software, to repel hackers even when they've fully breach one layer of security. Microsoft Azure Sphere, is the name given to the new solution for creating highly-secured, Internet-connected microcontroller (MCU) devices. It includes three components that work together to protect and power devices at the intelligent level. 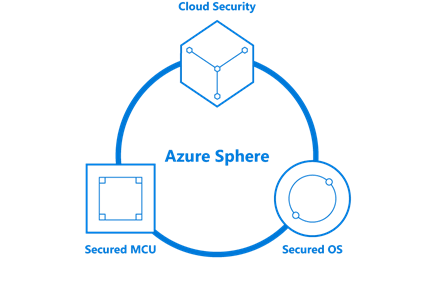 Azure Sphere Security brings the rigor and scale Microsoft has built over decades protecting its own devices and data in the cloud to MCU powered devices. It comprises both hardware (tiny chip called a microcontroller) that can go into smart devices and an operating system (Azure Sphere OS) that can run the device safely. This is perhaps the first initiative that aims to create a comprehensive system to lock down security on IoT system and devices. Microsoft, however is yet to announce any product partnerships, but two manufacturers already endorsed the project: refrigerator maker SubZero and consumer appliance manufacturer Glen Dimplex.